Dandruff, that very persistent and embarrassing irritant, is a very common scalp condition. And now to make things worse, the effect of dandruff is not just limited to your scalp. Research says dandruff can soon spread to other parts of your skin as well. The dry skin that you sometimes find near your eyebrows or around the nose area may not just be ‘dry skin’, it could, in fact, be facial dandruff. So today, in our article, we’re going to tell you some truth about these heretofore taboo topics, and you can learn everything you ever wanted to know about how and where do the flakes spread, how to get rid of them at home, and if or when you should consult your doctor. Because if we don’t discuss the itchy and gross dandruff, we are not going to learn to deal with them, right? Read on to find out more. How and Where Do The Flakes Spread? The effects of dandruff on your skin depend on your skin type, whether you have dry or oily skin. Any reddish, greasy or dry and scaly skin between your eyebrows or in the corners of your nose or T-zone could be the result of dandruff. Also, if dandruff is not treated on time, you may experience greasy, scaly and slightly inflamed skin on the upper back and chest. Most people believe that dandruff and its effects can be treated by using a lot of soap or moisturizers. This is incorrect, as it will only end up worsening the situation. However, it’s advisable to consult your dermatologist to get the right treatment for your skin problems. Prescription treatments, in severe cases, can help you properly cure the problem under expert guidance. Keep your stress level low, cut down on the use of chemical products and eat healthily! Do let us know in the comments below if you have liked this post. 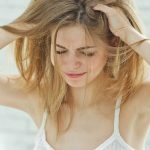 Wet Dandruff – What Is It And How To Treat It? Dandruff can be frustrating to no end. You scour every corner of the internet looking for natural remedies to get rid of this hair condition. You have probably been trying out treatments that are meant to treat dry dandruff when you actually have wet dandruff. Read on to know more about this condition.